H W & P (Legal) SERVICES is a local firm of professional Will Writers and Estate Planners and was established in February 2010 by Elizabeth Anne Hazell, focusing on serving her clients with professional estate planning services in the comfort of their own homes. Elizabeth worked in the legal profession for over 30 years in the Blackpool and Lytham St. Annes area. During her years spent working with Solicitors she was also involved with Licensing Applications and conveyancing (both domestic and commercial) and Will writing. 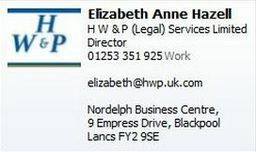 She worked for Taylor Poole Solicitors of Highfield Road Blackpool for seventeen years , the last seven years spent specialising in Wills, Probate (the administration of Estates following a death), Court of Protection work (Powers of Attorney, Applications for appointments for Deputies) and Deeds of Gift (Protective Property Transfers). When Taylor Poole closed in February 2010 Elizabeth set up Hazell Wills and Probate Services (now HW&P (Legal) Services) and also continued to work with local Solicitors dealing with Wills, Probate, Court of Protection work and Deeds of Gift. She is a member of the Society of Will Writers and as such is covered by a £2.5 million Professional Indemnity Insurance and abides by their Code of Conduct and Client Charter. She is also a member of the National Association of Licensed Paralegals. Wills a Will is a crucial document ensuring your estate passes to the people you want to benefit. This is certainly not guaranteed if you do not have a Will. Probate is the first step in the legal process of administering the estate of a deceased person, resolving all claims and distributing the deceased person's property under a will. This can be a daunting task, that can be made easier by someone with the necessary experience. Elizabeth has extensive cost saving experience in this area. Court of Protection Applications The Court of Protection in English law is a superior court of record created under the Mental Capacity Act 2005. It has jurisdiction over, the property, financial affairs and personal welfare of people who lack mental capacity to make decisions for themselves. Elizabeth has assisted many Clients with obtaining the relevant and necessary applications from the Court of Protection. Deed of Gift is a signed document that voluntarily and without recompense transfers ownership of real, personal, or intellectual property - such as a gift of materials - from one person to another. This is a tool used to reduce the potential of inheritance tax and loss of legacy to creditors. Family Legacy Trusts a more enhanced and protective tool for protecting a families legacy and reducing the cost of probate. These are just some of the products and services H W & P (Legal) Services Limited can offer their clients. Enhanced by personal service at their Clients convenience and competitive pricing, you would do well to consider contacting them.